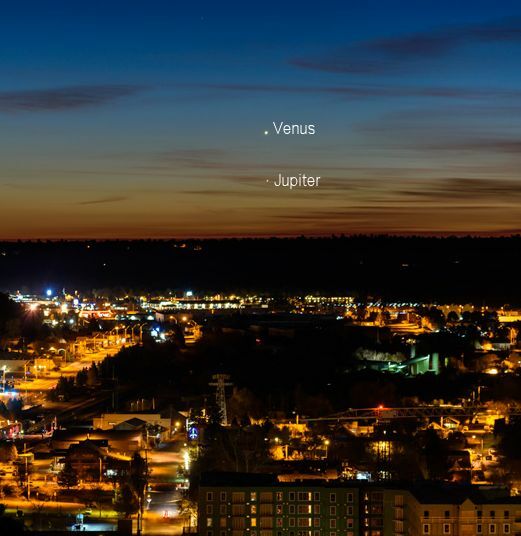 Spectacular Venus-Jupiter conjunction just before sunrise Monday | Watts Up With That? Set your alarm for before 45 minutes before dawn local time. On Monday morning, Nov. 13th, Venus and Jupiter will converge in the pre-dawn sky only 1/3rd of a degree apart. Look low and to the east about 30 minutes before sunrise. If you miss them on Monday, try again on Tuesday, Nov. 14th. The conjunction will be drifting apart, but still a beautiful sight. November 12, 2017 in Astronomy. The pic helps make sense of the ‘Plane of the Ecliptic”. Your right. It is not a mystery to me how our ancestors struggled to make sense of all the motion they saw, while at the same time, they were were unaware that they were moving as well. So, are we looking inward towards the sun as it rises, then past it towards Venus (on the other side of the sun) then Mars (also on the far side of its orbit away from us), and then Jupiter? Or is Venus on the same side of the sun as us, but between us and Mars? Venus has been a morning “star” since April. Jupiter was an evening object during the spring and summer, then was lost in the glare of the sun. Now it has become visible again and moved into the morning zone, too, as seen from earth. Not responsible for spelling error. That’s all the Daily Mail’s doing. Venus can never be more than 48 degrees above the horizon, either as Morning Star or Evening Star, because its orbit is within Earths relative to the Sun. So, in that view – which we can assume is today’s configuration, Mars must be also at about the 8:30 clock position to in line with Jupiter and Venus. 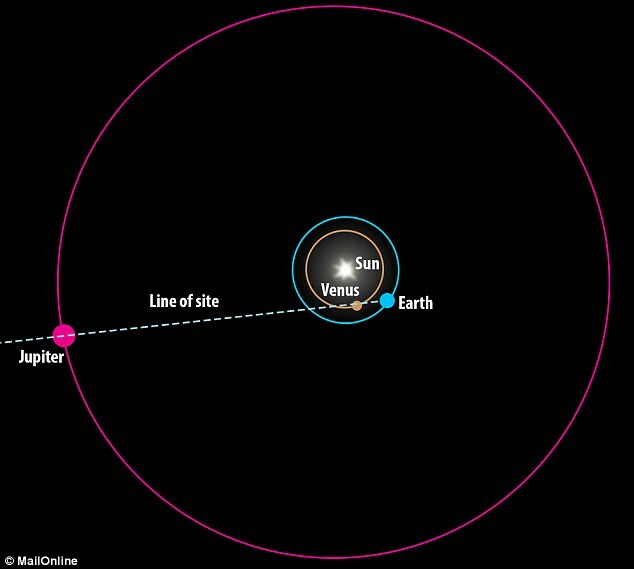 Leaving earth in the same position, the alternative configuration would require Jupiter to be at 12:00 (11:45 actually), Mars to be “ahead” of earth also at 11:45, and Venus on its orbit “inside” of earth, but ahead of it at 11:45. Is that correct with your interpretation? It is truly a wonder that the ancient astromers/astrologers developed two workable arrangements (Ptlomey’s epicycles to correct for the minor errors in an otherwise acceptable and logical earth-centered arrangement, and Copernicus-Tycho Brahe sun-centered perfect circular system, by simply looking upwards from the “inside” of 7 orbits. And all of that centuries before Kepler’s elliptical orbits solved the whole system. I’ve turned off the asteroids, comets, and the planets outside of Jupiter to make it easier to see. Was too cloudy for viewing here this AM. I’m the owner of the code. I copied it from a NASA app a few years back and added some embellishments. You can play with an older version on my Bravesite website (http://jamesbat.bravesites.com/) as WordPress doesn’t like applets. It only seems to work with Microsoft’s IE because it needs a signed certificate which I haven’t done. You must accept the Java warnings, but I assure you–there’s no bad code to worry about. If you want the source code, then I can send it to you. Venus is always between Earth and the Sun and Mars always between Earth and Jupiter. One of the reasons that Pluto isn’t a major planet is that its orbit at times lies inside Neptune’s. The Sun can be between the Earth and Venus. Put the sun at the center of a circle. Put Venus at 12 o’clock in her orbit, and put Earth at six o’clock in it’s orbit. Of course you’re right that Venus can be on the other side of the sun from earth. 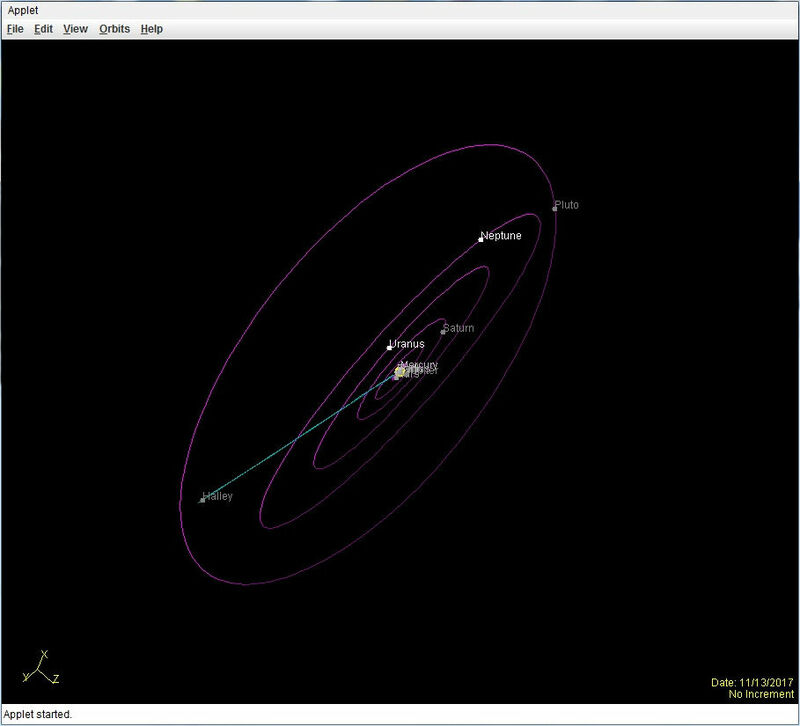 I referred to the orbits, such that Mars doesn’t figure in the conjunction of Venus and Jupiter. Put the sun at the center of a circle. This puts Earth between Mars and Jupiter. C, Paul, you persist at talking “galactic plane line-of-site” ….. while Gabro was talking Solar orbital location. What does orbit have to do with planet classification? 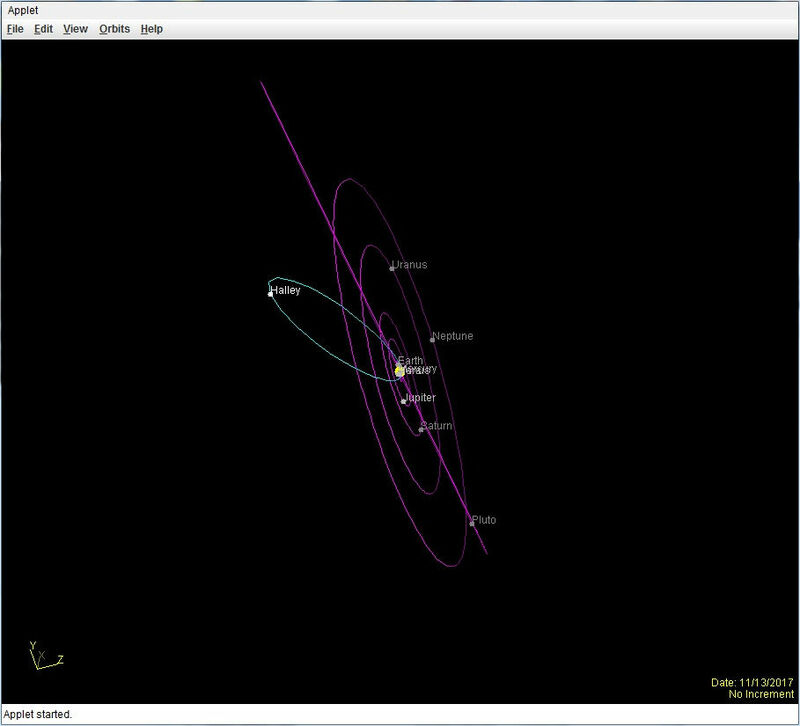 Also Pluto’s orbit is not in the plane of the ecliptic, so a top-down view of the Solar System is misleading. Orbit has everything to do with planetary classification. To be a planet, the body must have cleared the area of its orbit. Pluto hasn’t done so. That its orbit lies outside the plane of the ecliptic is another reason, plus its extreme orbital eccentricity. Among other reasons. Had Pluto been discovered in 1980 rather than 1930, it would never have been considered a planet in the first place. In 1930 it looked much bigger than it really is, because telescopes couldn’t distinguish Pluto from its moon Charon. Yes, I should perhaps have been more clear, but relied on the context of the discussion to make my point. Ahh, it’s clear the orbit. You do know that if Pluto isn’t a planet because it crosses Neptune’s orbit, then Neptune wouldn’t be a planet for the same reason. In truth, Pluto never crosses Neptune’s orbit, but it does get closer to the Sun at times. Also, Neptune and Pluto appear to be in an orbital resonance which further ensures that they don’t get too close. Neither reason would disqualify an object from being a full fledged planet. Planets aren’t defined by orbital eccentricity, and if they are in the ecliptic. No, planets’ orbits can be quite eccentric, as shown by Mars, but Pluto’s is more like a comet than a planet. 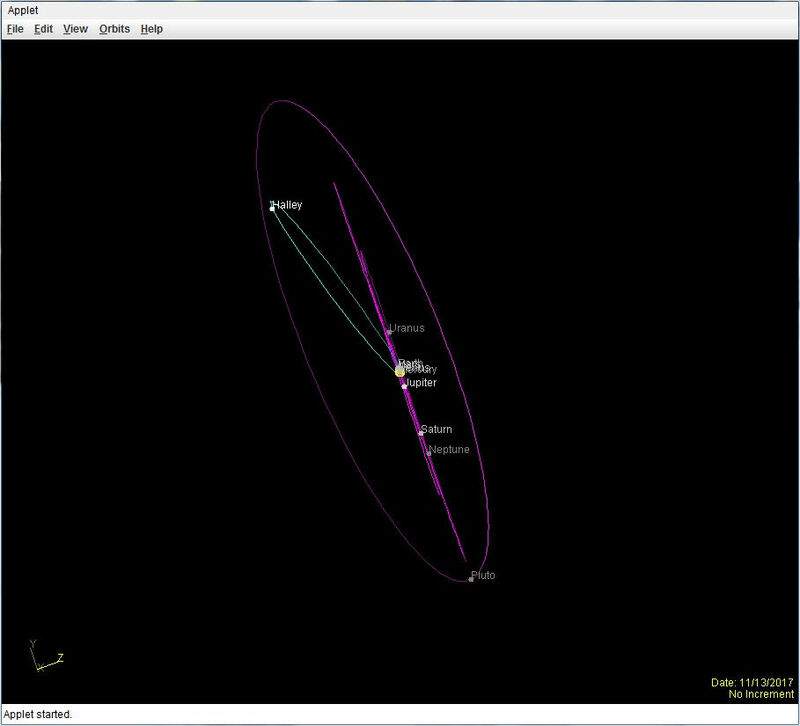 And, as you note, its orbit is tilted to the ecliptic. The key point is that it hasn’t cleared its orbit. There is no specific amount of mass left in its path which qualifies a planet, but the difference between a real planet and Pluto in this regard is orders of magnitude. The key point is that it hasn’t cleared its orbit. This one is top-down. I’ve added Halley for reference. This one is along the ecliptic. 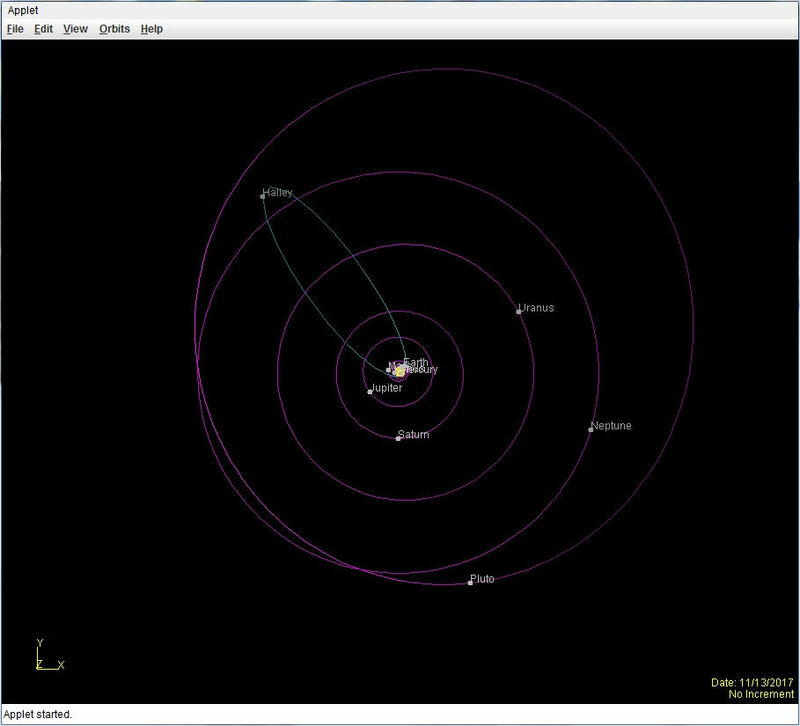 Here you see Pluto’s orbit completely outside of the planets. This one is along the plane of Pluto’s orbit. And finally, along the plane of Halley’s orbit. The simulator is showing objects in their relative locations for today’s date. HA, perhaps you should quit offering excuses for mistakes made by others. As far as I’m concerned, anyone that can’t or won’t “follow the context of the discussion” ….. should refrain from “negatively” commenting on the content/context. The author should not have re-state, re-hash every little detail every time a new comment is posted. But then I’m “old school” learned. Conjunctions portend chaos. In Feb 1524 there was a great conjunction with expectation of a climate catastrophe (a flood). In Germany the tension built before, during and after the conjunction, only to be released in the peasant wars. There was a flood, but it was it was not of water but blood — a more dramatic case of where expectation of catastrophe brings catastrophe (just like expectation of an energy crisis brings on an energy crisis). The prophesied doom associated with a Great Conjunction (Jupiter and Saturn) later that century however fizzled out. Great Conjunctions form “trigons” of earth, air, fire and water. As the GC of 1583 was the last in the watery trigon, it was widely supposed to herald apocalyptic changes, again likely floods. A papal bull against divinations was issued in 1586, and as nothing really significant had happened by 1603 with the advent of a new trigon, public interest rapidly faded. In my youth, I was a private pilot. One evening, with three passengers, I took off from Orange County Airport (SNA) in So Cal. I noticed a bright landing light from an aircraft to the west, and assumed it was a DC-9. I changed course, but the landing light brightness did not diminish. After another unsuccessful evasive maneuver, I contacted departure control requesting an avoidance vector. Departure control asked me what kind of craft I was piloting. I responded it was a Piper Warrior II. He informed me that Venus would have no problem in avoiding my flight path, inasmuch as I was flying such a low performance aircraft. I hoped like hell my passengers did not understand the radio traffic. Sheesh. You’re not the only pilot to fall victim of that. link In the linked story, the pilot took evasive action and people were injured. The accident was caused because a pilot woke up from a nap, naps are allowed because there are two pilots in the cockpit, and mistook Venus for an oncoming aircraft. I look forward to many similar accidents as nearly, but not quite, self-driving cars like Tesla become common. Folks will be drowsing, misperceive situations and cause accidents. Warriors are from Mars, so no worries. Ahhh…very good for your love life! Lol. At 7′ 33″ degrees in the sideral sign of ‘Scorpio’ no less. What else will you be doing at 6 Am in the morning on a holiday Monday for many? Oh right, out looking at the heavens of course. I will be. The two planets will also be fairly close to each other in the days just ahead of and just after the conjunction, both being just over 1 degree north of the celestial equator. Venus and Jupiter will pass within 17 arc minutes (0.28 degrees) of each other in the sky, or just over half the apparent width of the full moon. That is about as close a conjunction you can get without what is called an occultation conjunction (eclipse) when the two would actually merge. The Moon will also make a showing on Thursday and Friday morning as well, making for a spectacular sight. I am hoping for clear skies! What a beautiful solar system we live in. it’s starting with demolition by earthquakes (the last 7day has produced 5x the annual average) https://earthquaketrack.com/recent. The CO2 has realigned the planets, that caused the earthquakes, that made the dog rush to the door (when the postman came) breaking my favorite coffee cup; so that just proves what a powerful molecule CO2 is, just ask Griff for conformation, (she’s an ex Bert). But never mind the detail, stick with the fake fact, it makes a better story. Wow spooky. Surely to shine they need to be beyond the sun? It’s a sign of increased work for everyone. Many will be forced to leave their comfortable homes. Within hours there will be traffic jams in the big cities. What? You think I am making an astrological prediction? No. I’m predicting what CO2 will cause, on Monday morning. I like how when you watch Venus in the sky, it sometimes rises in the west and sets in the east, when you watch that happen, it gives you a better understanding of the planetary orbits and scale involved. So what does this very close conjunction suggest regarding a link between the 11 year solar cycle and the tidal effects of Venus, the Earth and Jupiter. 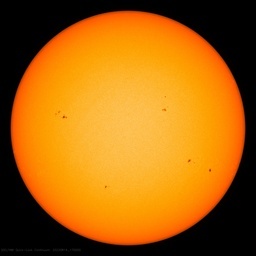 Is today the kick-off for Solar Cycle 25? A year or so early? Planetary conjunctions are meaningless regarding a link between the suns solar cycle, relativity is the key, planetary orbits have a relative timing with the sun. Planetary orbital parameters can be very accurately forecast into the future and past. Due to observations of planetary positions and conjunctions the position and timing of the planets can be worked out. Due to observations of the sun, its reversing polarity can be accurately timed. Comparing planetary parameters such as orbital timing with the timing of the suns polarity reversal, relative markers in the suns activity that include longer solar minimums with weaker solar maximums can be aligned to relative orbital parameters. Earthling2, Planetary conjunctions are used as a tool to correct our observational bearings of planetary orbits in relation to the stars. The suns rotation is faster at its equator than it is at its geographic poles. The Suns rotation is in the same direction as all the planets. As mass, the solar system does have an effect on the Sun, planetary bodies distribute their mass through their orbits, they speed up, slow down, they move above the solar plane and below it. The Sun has a polarity that rotates and reverses geographically around the Sun, the “magnetic polarity” travels from the suns geographic poles to the its equator. This produces sunspot activity. Sunspot activity is regulated by the speed of the suns polarity reversal. When the suns polarity reversal is reversing at a fast pace, it increases sunspot intensity to produce high peaks in solar cycles and short solar minimums. When the suns polarity reversal is reversing at a slow pace, it decreases sunspot intensity to produce low peaks in solar cycles and longer solar minimums. The speed of the Suns polarity reversal speeds up and slows down. 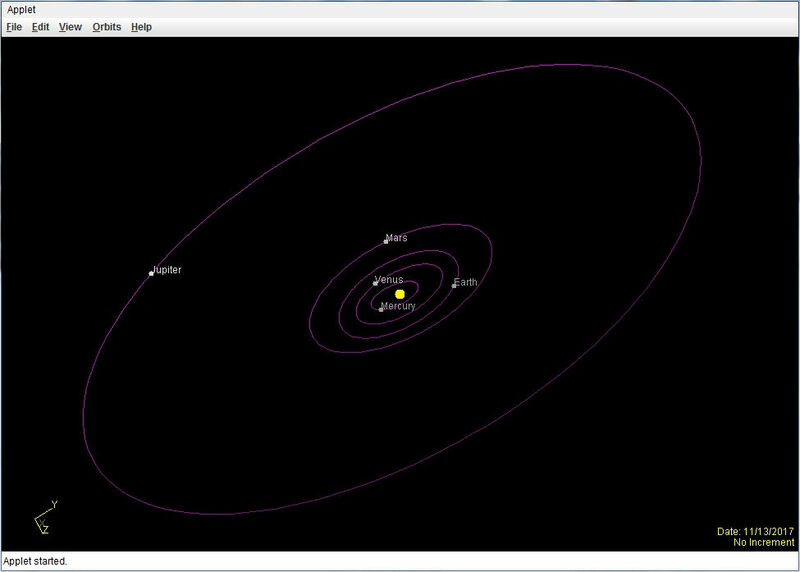 Planetary orbits speed up and slow down in line with the suns polarity reversals. There is only one planet in the solar system that matches the suns polarity reversal. “There is only one planet in the solar system that matches the suns polarity reversal.” Yes, well that is sort of my point, as you presumably refer to Jupiter. Is it a coincidence that every 11.07 years, the Sun and the planets Venus, the Earth and Jupiter are aligned? And approximately every eleven years the polarity of the Sun’s magnetic field is reversed, with solar activity peaking with the same frequency. This manifests itself in an increase in sunspots – dark patches on the Sun’s surface which originate from strongly concentrated magnetic fields. The tidal influence of Venus and Earth while much closer than massive Jupiter, are that much more weaker but closer to the Sun, and the entire tidal influence of J,V, and E are more than just Jupiter itself. There does seem to be some periodic connection to this, which may also be more than just tidal influence i.e. magnetic fields. I am certainly not making any predictions about SC 25, or even trying to establish causation with these geocentric conjunctions as seen from Earth, but it is an interesting correlation, which some could say is more synchronicity and coinciding conjunctions. I am certainly not an expert in this, and there is a whole lot more going on than just this, so will leave it at that since I only know enough to be dangerous. But it is all very interesting. As our long lost ancestors must have wondered aloud, when they noticed the ocean tides ebbing and flowing with different phases of the moon. This is the planet I was referring to, it’s poles rotate at the same rate as the suns polarity reverses. There is a relative timing between the Sun and planetary orbital parameters. Didn’t anyone take a photograph of the conjunction? Earthling2, I believe that last one was taken on the 12th, like the from Flagstaff A.W. posted in this article. That is a very nice pic Brains…Going to clip that and keep it. Should be the ‘weather’ pic of the day. Our ancient ancestors must have been having conniptions that the two ‘stars’ were going to crash into each other when they watched stuff like this happening in real time around the camp fire.